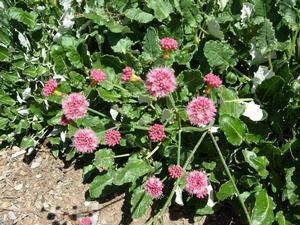 Rosy buckwheat is an evergreen subshrub that forms a compact mound about 12-15" tall and 1-3' wide. Rounded clusters of rosy-pink flowers bloom in spring and are a good source of nectar for bees, butterflies and many other beneficial insects. In the wild, you can find rosy buckwheat on three of California's Channel Islands off the Santa Barbara coast - Santa Rosa, Santa Cruz and San Miguel Islands - where it grows on coastal bluffs and rocky slopes in coastal scrub and grasslands below 700'. Rosy buckwheat is an evergreen subshrub - the botanically correct term for a perennial whose stems become woody at the base as they age. It forms a mound of oval leaves that are gray-green on top and white underneath. The top sides of the leaves often looks greener in spring after the winter rains, then become greyer as summer progresses. The mound of foliage typically grows to around 12-15" tall and 1-2' wide, although can sometimes reach 3' wide. The blooming season usually starts in April and can last through June depending on the weather and where you're gardening. 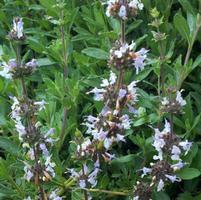 Rounded tight clusters of small flowers bloom on upright stems that grow about 6-8" above the foliage. In the wild, flower color can vary from pale pink to dark rosy red. Pale pink flowers can look a little insipid, so if you're wanting plants with bold-colored dark pink or reddish flowers, then check with the nursery first to see what color the flowers should be. Rosy buckwheat can tolerate full sun in both coastal and hotter inland areas. It'll also do well with just morning sun or in dappled shade. Rosy buckwheat is fairly tolerant of most soil types including clay. It just doesn't want to be planted in a spot that's completely waterlogged for prolonged periods. 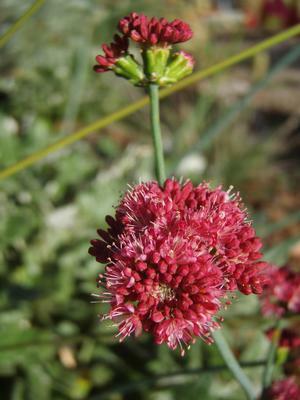 Once established, rosy buckwheat will survive on rainfall alone in coastal areas. In hotter inland areas, it'll look better with a deep watering once a month from June through September. Rosy buckwheat looks great edging a path, mass-planted in a meadow between grasses, at the front of a mixed planter bed. 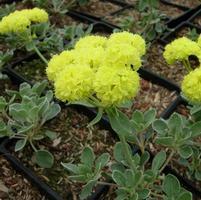 Use it as a small-scale groundcover or in a rock garden. All buckwheats are great nectar and pollen plants for bees, butterflies and many other insects. The seeds are a good food source for seed-eating birds such as finches, juncos, sparrows, towhees, quail and grouse. Rosy buckwheat doesn't usually suffer from any pests or diseases. Deer may sometimes nibble on the leaves and may pull young plants completely out of the ground. If this is a problem, protect young plants from deer by placing an upturned gopher basket over them. You can easily grow rosy buckwheat from seed. No special treatment is needed. Seeds should start germinating within 7 to 21 days after sowing depending on the temperature. Cut off flower stems at the base after the flowers have turned brown. If you'd like seedlings, then don't cut off the flower stems until seeds have formed and dropped. Leaving the stems on for longer will also provide food for seed-eating birds. If plants become leggy, prune the stems back to about 4" above ground level. Make each cut just above a lateral bud i.e. just above where a pair of leaves joins on to the stem.